The majority of sightings that are reported to the group typically describe spherical, disc-shaped or triangular objects. However sometimes objects of a more unusual shape are also reported. This report covers one such sighting by a highly credible witness – a 49 year old retire police constable named Ian Sawyer. Ian lives in Blackley, North Manchester, and used to be part of the South Yorkshire police force. Several days before Christmas 2009 he had a very unusual sighting which prompted him to get in touch with BUFOG. It was 8.38pm on the evening of 22nd December 2009, and a very clear, still and cold night. There was very little cloud cover and the stars and moon were fully visible. It had been snowing earlier in the day, there was about 3 inches of snow covering the ground. Ian was sitting in his lounge at the computer and having an internet chat with a friend on Yahoo Messenger. The lounge window runs directly behind his computer. The view from the window overlooks the old Booth Hall Children’s Hospital site on Charlestown Road. Suddenly an orange glowing light caught his eye, and he glanced out of the window to see where it was coming from. He immediately caught sight of a very strange large glowing object in the night sky. The object was the shape of a widened crucifix lying sideways, and was glowing a fiery orange color. At first Ian assumed it was an aeroplane on fire, but then realized it couldn’t be due to it’s shape and size. It had very defined straight edges and appeared as a single solid object. Ian estimates it was 3 or 4 times the size of a jumbo jet. He believed it was situated over a wooded area in the local vicinity, and at least a couple of thousand feet high. The object was moving extremely fast, hundreds of miles an hour, faster than a military jet would fly at. It was on a level flight path heading to the North in the direction of Middleton. When Ian first sighted the object it was about a 3rd of the way across the view from his lounge window. Due to the speed of the object it was only a couple of seconds before he had completely lost sight of it off to the left of the window. He immediately thought about grabbing his camera but then remembered that the batteries were flat. Because the object was moving so fast it is unlikely he would have had time to photograph it anyway. He moved to the right to get a different view through the window but the object had completely vanished from sight. NOTE: NUFORC currently has 237 reports of cross-shaped UFO on file. One of the more interesting cases on record was the Devon Flying Cross. 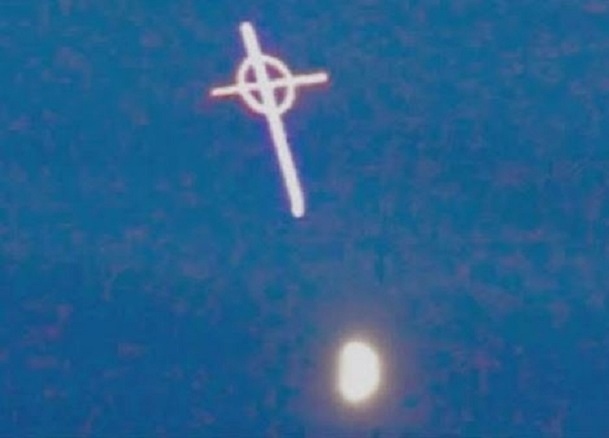 When I started to look over the reports, I was amazed at the number of the cross-shaped UFOs that have been reported. Most of the UFOs were white or orange in color…some would morph in another shape (mostly a cigar or cylinder). There has been a very high number of orange and orange-red orbs recently seen worldwide….The above image is an actual photo taken in the United Kingdom.